Undenatured Whey Protein Concentrate 82%, Cocoa Powder (Chocolate, Chocolate Mint, Chocolate Cookies & Chocolate Orange), Natural Flavouring, Stabiliser (Xanthan Gum), Natural Colouring (Banana & Vanilla - Beta Carotene; Strawberry & Raspberry - Beetroot Red), Sweetener (Sucralose), Soy Lecithin (E322 - Instantising Agent). Pure Whey Protein is exclusively available from BULK POWDERS and at the lowest price point for any comparable Whey Protein Concentrate in Europe! It is a premium quality whey protein concentrate that contains a massive 82% whey protein. This makes Pure Whey Protein a great source of BCAA and Glutamine â€“ perfect for any active individual. 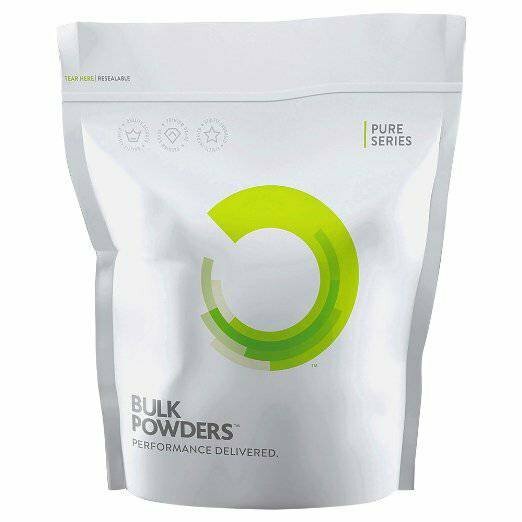 BULK POWDERS Pure Whey Protein is of exceptional high quality, being un-denatured, processed at low temperatures and going through high quality production processes: advanced cross-flow membrane filtration. In addition, Pure Whey Protein is derived from grass-fed cows, something that not all whey protein suppliers can offer.